The Stalinverse reboot devised by Valiant Entertainment continues with a host of new episodes in the works. 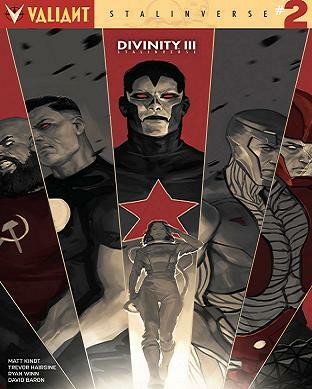 Divinity III: Aric, Son Of The Revolution #1 was published on January 18th and Shadowman & The Battle Of New Stalingrad #1 is scheduled for February. In Divinity III Stalinverse we will begin to observe more pieces fitting into place. In this alternate reality as we have discovered the Soviet Union is the world’s reigning superpower. But all is not as it appears. Colin King, a Russian intelligence officer, can’t shake the feeling that something is wrong with this reality. He is determined to track down the missing cosmonaut Abram Adams, who just maybe holds the answers to what is happening behind the scenes in the new world order. The audience is slowly being channeled towards the architect of this dystopian world. A resistance movement is arising with Colin King, known as Ninjak in the regular Valiant universe and others opposing the world order now taking up the cause. But can they unravel the mystery behind Abram Adams? This segment of the Stalinverse story is being crafted by Matt Kindt (Rai, Suicide Squad) and Trevor Hairsine (Divinity, Judge Dredd), the duo have guided the Divinity publication since its inception. Episode #2 comes out on January 25th and two more issues will be published in this series.